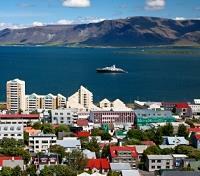 Tour Reykjavik, the Golden Circle and the Lake Myvatn area with private guide. 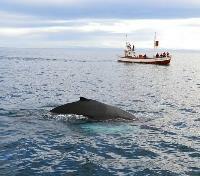 Horseback ride and whalewatch in Iceland’s North. 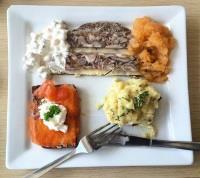 Enjoy tasting menu meals at renowned Icelandic restaurants. 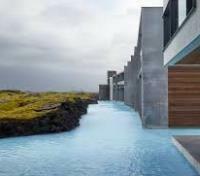 End in ultimate luxury at the Retreat at Blue Lagoon, with its own private lagoon and world-class spa facilities. Iceland is for lovers. Synonymous with natural splendor and spectacular scenery — massive glaciers, azure lagoons, black-sand beaches, bubbling geysers, and magnificent waterfalls — this picturesque island nestled at the top of the world exudes an otherworldly beauty you won’t find anywhere else. But Iceland’s geographic charms are just the tip of the iceberg, so to speak. Its wide-open spaces lend themselves to enchanting activities — think horseback riding, whale watching, geothermally-heated baths, and candlelit dinners — often kissed with an eccentric twist. Vast and gorgeous, at times you can feel as though you have the entire country to yourself. And really, it doesn’t get much more romantic than that. 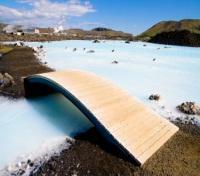 From the true capital, Reykjavik, to the capital of the North, Akureyri, this special honeymoon trip is designed to treat you to the highlights of the land of ice and fire, both thrilling and charming, before culminating in the most unforgettable way - a lavish stay in ultimate luxury at the Retreat at Blue Lagoon. With its own private lagoon, world-class spa facilities, and views out over the majestic volcanic landscape, you'll be left simply in awe. 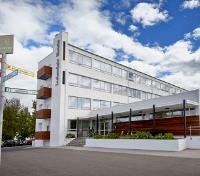 Welcome to the Reykjavik Konsulat Hotel, Curio Collection by Hilton, where Icelandic history and style meet. 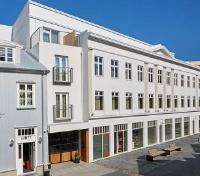 Once a 1900’s department store, this charming building has been renovated with modern amenities and nods to Reykjavik’s vibrant culture. It is a quick walk from the city center hotel to the country's Parliament, Harpa Concert Hall, the Laugavegur main shopping street, and top restaurants and nightlife. An award-winning chef is at the helm of the hotel restaurant and bar, serving up impressive gourmet experiences to every guest. The hotel's boutique rooms and suites are designed with cosmopolitan flair and your comfort in mind to ensure a space that’s just right for you. 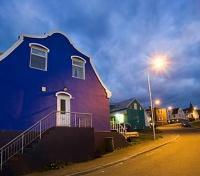 For a city so heavily steeped in Viking history, the cityscape of Reykjavik is surprisingly modern. The best way to discover the history and culture of Reykjavik is with a constant thread of food and beverage to lead you around the city. Setting out with a private guide, tastings will be provided for you as you set out on a food-themed walking tour through central Reykjavik, where you'll learn a bit of history, see the city's iconic cathedral, and get a taste of traditional Icelandic food all at once. You'll head to a restaurant located directly across from the stunning mid 20th century Hallgrimskirkja Church - the largest in all of Iceland, where you can spot an impressively intimidating sculpture of Leif Erikson, donated by the United States in recognition of the discovery of the New World by Norse explorers from Iceland. Enjoy some traditional fish stew, smoked char and lamb, along with a sweet sugar crepe. As you wander the city, you'll be treated to some codfish soup paired with wine or beer, stop at a pub for some dried cod, and if you're adventurous enough, fermented Greenland shark with some birch schnapps to wash it down. End on a sweet note with a stop for some kleina (Icelandic donuts) in caramel sauce before returning to your hotel. No first trip to Iceland would be complete without experiencing the country’s most famed touring route, the Golden Circle. With your private guide and a specially-modified Super Jeep, set out on a full-day tour, making stops to visit the three most iconic natural sites Iceland has to offer along the way, in addition to a remarkable glacier snowmobiling excursion. Explore the mossy Thingvellir National Park, site of the world’s first ever parliament dating back over 1,000 years, as well as the visible continental divide between the American and Eurasian tectonic plates. The park offers dramatic scenery and woodland that changes colors throughout the year, making the area a photographer’s delight. You’ll also encounter the magnificent Gullfoss, one of Iceland’s largest and most photogenic waterfalls, with water constantly rushing from a river that’s fed by the melting Langjokull glacier. It's this same glacier that you'll get to experience up close as your tour kicks into high gear with a thrilling small group snowmobile excursion onto Langjokull, Iceland’s second-largest glacier. Gear will be provided, and you'll ride the machines in pairs, enjoying a unique glacial experience. Bring the pace back down with a drive to the final pillar of the Golden Circle. Discover the great Geyser geothermal area where the dependable Strokkur geyser spouts hot water as high as 100 feet in the air, every 6 minutes or so, offering an entertaining show to say the least. Conclude your day on arrival back to Reykjavik. 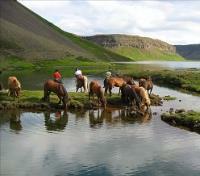 A short fifteen minute transfer of Akureyri will bring you to the beginning of your horseback riding excursion. 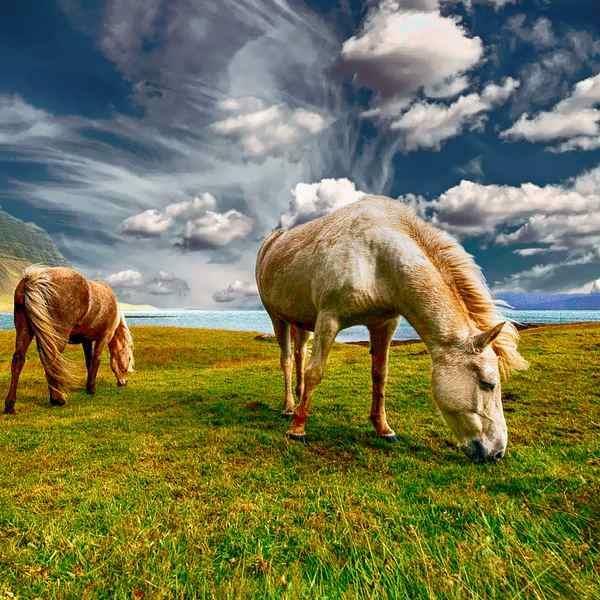 In a small group of no more than 10 participants, you’ll saddle up on beautiful Icelandic horses for a guided 1-hour ride along the scenic seaside and hills of Northern Iceland. Unique to Iceland, these beautiful animals have been purebred for centuries (since the days of the Vikings), strictly avoiding influence from other horse breeds from around the world. Featuring a stature and gait entirely their own, a ride on these beauties needs to be experienced at least once in a lifetime. When your ride comes to an end, you’ll be welcomed into a countryside restaurant for an included 2-course local dinner, where organic and locally grown produce is used whenever possible. After the meal, you can relax in the hot tub with a great view over the surroundings, or take short walk down to the ocean to breathe in the sea air and watch the birds. Note: this excursion is not suitable for travelers under 12 years old. If you expect to partake in the hot tub, please bring your bathing suit and towel. Located a short walk from the Akureyri city center, Icelandair Hotel Akureyri is both friendly and inviting, offering the perfect place to enjoy the local culture, restaurants, museums and historical sites in the capital of the North. The view from the hotel is magnificent, and the 100 guestrooms are bright and comfortable with Icelandic design at the forefront. The patio for the on-site restaurant and bar leads to a lovely hotel garden, where guests are invited to sit around the fireplace and keep warm under leather covers. Just two minutes away on foot, the Sundlaug Akureyrar water complex features year-round geothermal pools, a nice treat amidst the adventure that is Iceland. Make your way to the floating pier at Akureyri's seaside Hof Cultural Center, and set out on a small group whale watching safari by RIB (zodiac-style boat), in hopes of spotting the incredible Eyjafjord Humpbacks in their natural habitat. 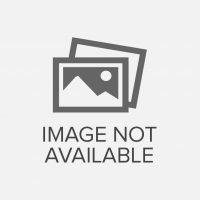 Fast, small, and maneuverable, these boats will get you out the quickest to the best areas for spotting whales, offering a super intimate experience, being so close to the water level, and with minimal disruption. The warmth of the summer sun brings vibrant life and plenty of food to the fjord, and following it, in a feeding frenzy, come the larger-than-life humpbacks. While nature doesn't allow for any guarantees, the expert guides will position your boat in the most ideal positions to spot any number of sea animals, from whales, to dolphins, and seabirds alike. Conclude your experience on arrival back to the pier. Set out today with your private guide, embarking on a discovery of the north's scenic Lake Myvatn area approximately an hour east of Akureyri. En route, you'll make a stop at the Godafoss waterfall, considered one of the most beautiful waterfalls in Iceland. Some call it a miniature version of the Niagara Falls. You'll continue on to Lake Myvatn, revered for its rich flora, fauna (15 species of duck! ), and spectacular lava formations, including magnificent rock pillars near Hofdi on the southern shoreline. You'll come to the Grjotagja lava cave, the beauty of which was famously captured in a bathing scene with Jon and Ygritte in Season 3 of HBO's Game of Thrones. Continue along with the colorful sulfurous slopes of Namaskard pass to one of Europe's most powerful waterfalls, Dettifoss. At over 130 feet high and 325 feet wide, up to 1500 metric tons of water, mud, and sand, rumble into Jokulsargljufur, the greatest and the most spectacular canyon in the country. Heading back west, you'll travel along the northern side of Lake Myvatn. On this side you'll stop at the Krafla volcano and its crater lake Viti, before continuing tothe geothermal field of Hverir, with bubbling mud pools painted in sulfuric pastels. At Skutustadagigar nearby you'll walk the rim of amazing pseudo-craters. 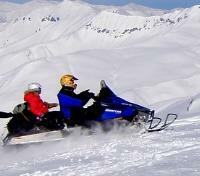 Conclude your day on return to Akureyri. Meet your private driver for a transfer to Grindavik. Approximate travel time is 45 minutes. 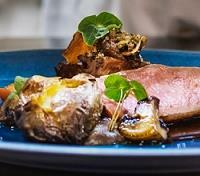 This evening, tuck into the cozy ambiance of the epicurean Moss Restaurant at The Retreat Hotel. You'll be treated to a remarkable 5-course tasting menu, sampling a dazzling assortment of curated dishes which highlight the chef's elevated and creative approach to fresh, local and seasonal Icelandic ingredients. Everything at Moss is prepared with an affection for the island and its endless bounty of nourishment. 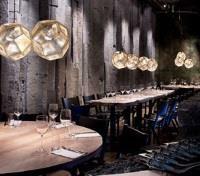 Please note, drinks are at individual discretion, and payable on the spot. 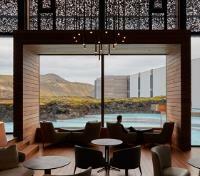 Encircled by the mineral-rich waters of the Iceland's iconic Blue Lagoon, the Retreat Hotel at Blue Lagoon Iceland is a place of timeless sophistication, luxurious comfort, and blissful relaxation. Leave the world behind and enter a realm of relaxation, rejuvenation, and exploration. From the moment you step through the doors and are greeted with a champagne welcome, the penultimate luxury experience awaits. Modern, exclusive suites use clean lines and natural, local textures to create unique, warm, minimalist spaces that harmonize perfectly with the surrounding landscape. All suites step out to private balconies with breathtaking perspectives, overlooking the vivid pastel blue waters of the lagoon, and the rugged and otherworldly volcanic horizon. Committed to providing an environment focused on true serenity, the Retreat features its very own exclusive private lagoon for guests, along with a world class spa, offering a range of natural, rejuvenating treatments. Within minutes of your arrival at the Retreat Hotel at Blue Lagoon, you'll surely realize how refined elegance and modern luxury is a humble understatement. Enjoy a day at leisure in the refined luxury of The Retreat at Blue Lagoon. Perhaps take a yoga class offering views over the volcanic landscape, revitalize your skin with a three-stage treatment at The Ritual, escape with a private in-water massage, rejuvenate mind, body and soul at The Spa, dine on delectable cuisine at the epicurean Moss and Lava Restaurants, or simply soak in the powder blue waters of the exclusive Retreat Lagoon. For an extraordinary ultra-private suite, you can even opt for the Lava Cove, a spa within a spa, with personal attendant. To top it off, guests staying at The Retreat over the winter months can receive overnight Northern Lights wake-up calls when the aurora is visible from the hotel. At The Retreat at Blue Lagoon, they've simply thought of it all. Meet your private driver for a transfer to the Keflavik Airport. Approximate travel time is 20 minutes.